Struggling to get it all done? Feeling overwhelmed with homemaking? These time management tips from some of the top homemaking bloggers will help! When I recently I did a survey and asked about people’s top challenges when it comes to homemaking and overwhelming the top answer was finding time to get it all done. The first thing I want to encourage you to remember is that while homemaking is important, having a perfect home is not important or even possible. Jessica Turner talks a lot about this in the book The Fringe Hours and I really love this quote. We want our homes sanitary and hopefully comfortable for us and our family but we don’t need it to be perfectly decorated or picked up. I do know from talking to some of you that even the necessary homemaking tasks can be overwhelming. We have so many things going on in our lives. Many of us work outside of the home, have kids, volunteer, have health concerns, the list goes on and on. We all have the same 24 hours in a day so good time management is key. To help with this issue I reached out to some of my favorite bloggers and asked for there best time management tips for homemakers. They shared some great information that can really help reduce the overwhelm and help us get more done. Time blocking is a time management technic that can help you avoid getting distracted and help you use your time wisely. Katie at My Sweet Home Life has some great information on using time blocking. An organized life helps so much when it comes to time management. If things aren’t organized it’s harder to do just about everything. Becky at Simply Intentional Life has some great tips for moms and some great time management printables. Having a plan and making sure everyone in the family is on the same page is very helpful, especially during busy times. Not having a plan is a good way to make sure things will fall through the cracks. Deanna at Life With Dee likes to have a weekly planning session with her husband to make sure they are both on the same page. Creating a daily routine you can actually stick to is a great way to manage your time better. Often we try to create daily routines that sound good but in practice, we can’t keep up with them. Alison at Organized Motherhood has information to help you create a manageable daily routine you will actually use. Speaking of routines, a good morning routine can set your day up for success. My whole day feels more productive when I’m following a morning routine. If you want to learn more check out my post A Homemaker Morning Routine. Especially during busy or stressful times having a long to-do list can just seem like too much. Having a top 3 can help you feel like you have been productive and make sure you are getting to the most important things. Alli at Scattered Squirrel has some great tips and printables for writing a less overwhelming to-do list. 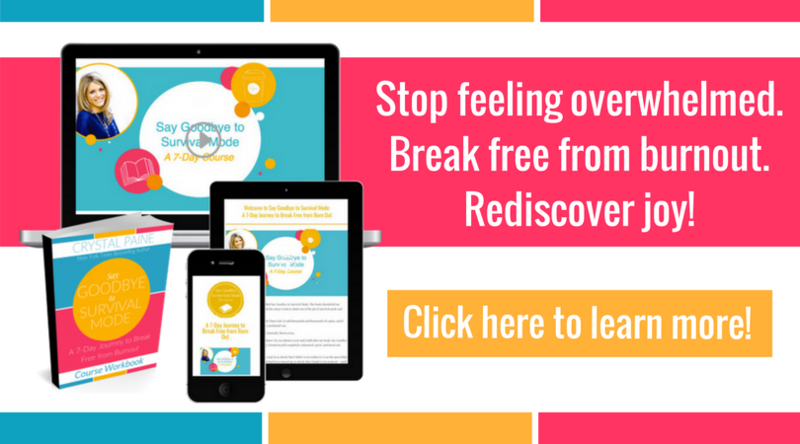 If you want to learn even more valuable information to help you stop being overwhelmed I highly recommend Crystal Paine’s course Say Goodbye to Survival Mode. Looking for even more tips to make homemaking less overwhelming? Sign up below for my mailing list.